As the first faint streaks of dawn poked over the distant hills the blast came. A vivid flash of light pierced the desert darkness and lighted up the entire countryside. It lasted but a moment or two then was gone. All eyes turned toward the spot where the bomb had exploded. They saw a big ball of furiously churning fire, smoke, sand and debris rapidly rising from the ground in huge, rolling waves. 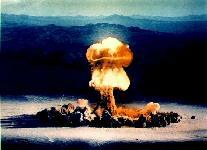 The afterglow remained for several minutes while the mushroom cloud continued to rise then drift away and apart. Then sun was still below the horizon but daylight was coming fast. Broad streaks of sunlight slanted over the mountain tops like ghostly fingers clawing at the heavens. Rumbling of the shock wave continued for nearly five minutes, bouncing back and forth from one mountain wall to another. By 1953 a pattern of test activity at the Nevada Proving Ground had emerged. 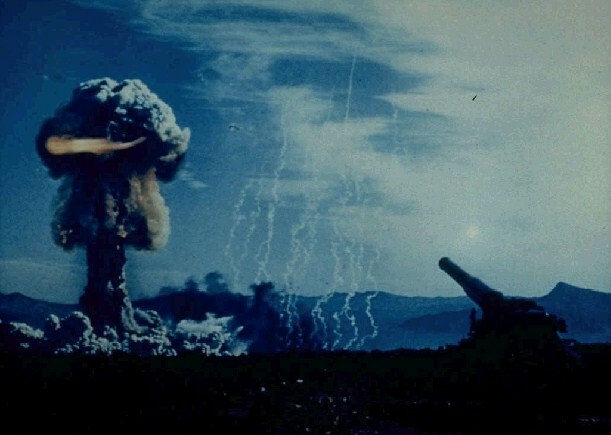 Through the fifties, every year or (every other year if a pacific test series intervened) a series of several shots was fired at the NPG over a period of three or four months to address a wide variety of objectives. Upshot-Knothole was just such a scatter-shot effort. Technical information to assist in weapon design was obtained in several tests. 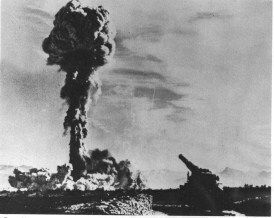 Efforts to prepare the U.S. military for atomic combat continued with proof-tests of a number of new tactical weapons, including the first nuclear artillery shell. 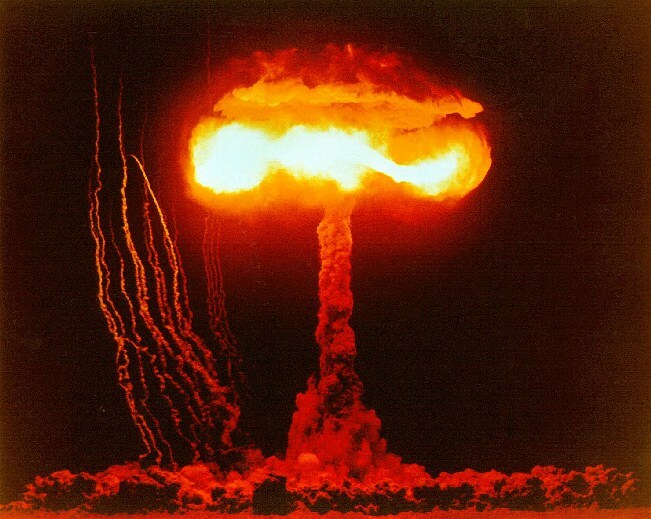 The tests provided additional experience and information for planning atomic combat operations. Important information was also obtained for civil defense efforts. 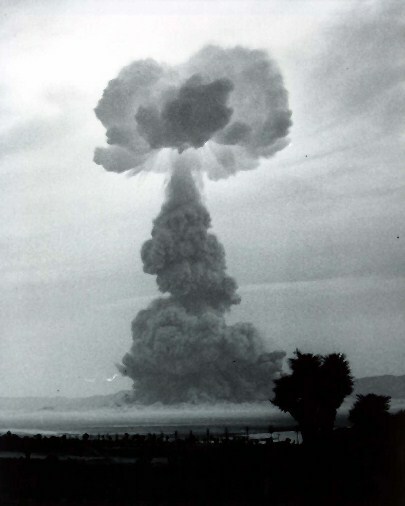 And critically important - Upshot-Knothole also tested the radiation implosion systems for the world's first deployable thermonuclear weapons which would be proof-tested in Operation Castle the following year. An estimated 18,000 DOD personnel participated in observer programs, tactical maneuvers, scientific studies, and support activities. 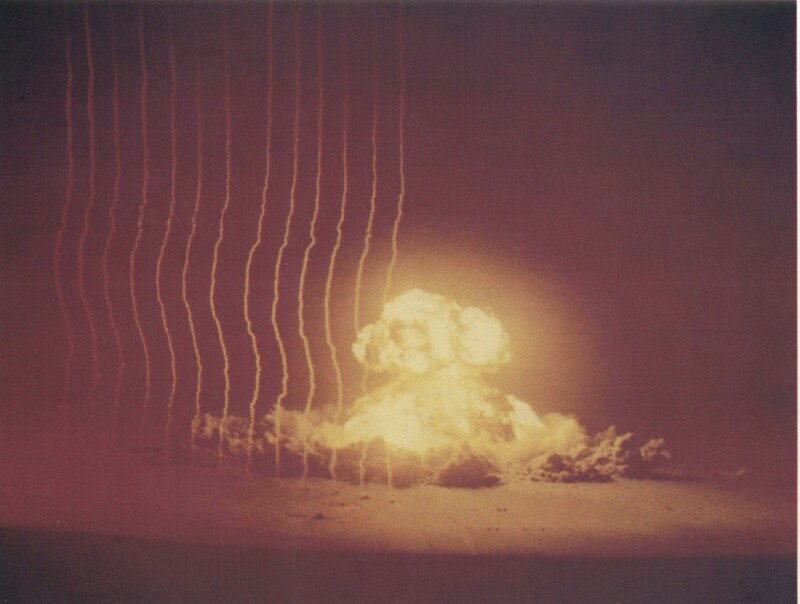 Members of all four armed services participated in Exercise Desert Rock V.
This operation exposed exercise personnel to nuclear tests, and thus radiation, more aggressively than previous ones. 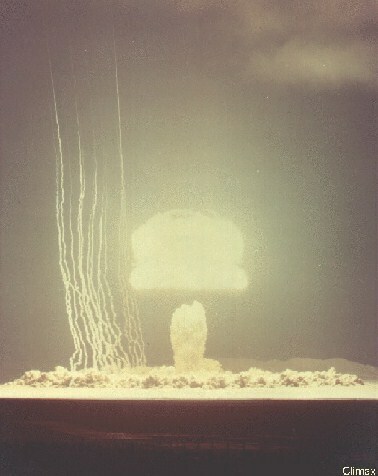 Observation by troop formations were conducted at what was calculated to be the minimum safe separation distance, with many personnel being exposed to multiple tests. Under current occupational radiation exposure limits (0.3 rem/week and 5 rem/year) this would would limit maximum exposures to 3.3 rems over the 11 week operation. Approximately three thousand soldiers reached or exceeded this limit, with 84 exceeding the annual limit (the highest recorded exposure was 26.6 rem). These exposures do not produce observable symptoms, they simply increase the lifetime risk of cancer a small amount. The effect on the downwind civilian population, taken together, was much worse. Uphot-Knothole released some 35,000 kilocuries of radioiodine (I-131) into the atmosphere (for comparison, Trinity released about 3200 kilocuries of radioiodine). This produced total civilian radiation exposures amounting to 89 million person-rads of thyroid tissue exposure (about 24% of all exposure due to continental nuclear tests). This can be expected to eventually cause about 28,000 cases of thyroid cancer, leading to some 1400 deaths. Chart of fallout exposures from "underground tests". From National Cancer Institute Study Estimating Thyroid Doses of I-131 Received by Americans From Nevada Atmospheric Nuclear Bomb Test, 1997. Go to the National Cancer Institute and get the full report. In an effort to calm public fears about weapons testing, Annie was an "open shot" - civilian reporters were permitted to view it from News Nob, 11 kilometers south of the shot-tower. Annie was a weapon development test, it was an experimental device (code named XR3) that provided additional information to normalize the yield-vs-initiation time curve. It was a Mk-5 HE assembly using a Type D pit, and used a betatron for external initiation (the third such test). Total device weight was 2700 lb, predicted yield was 15-20 kt. This was a test of the TX-15 "Zombie" thermonuclear weapon design scheduled to be proof-tested at the Pacific Proving Grounds in 1954. 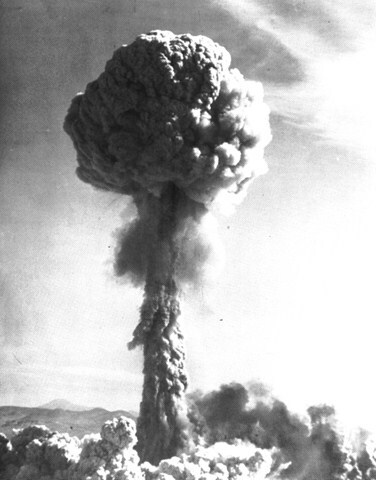 The device, code named Nevada Zombie, tested both the RACER primary and the TX-15 radiation implosion system. 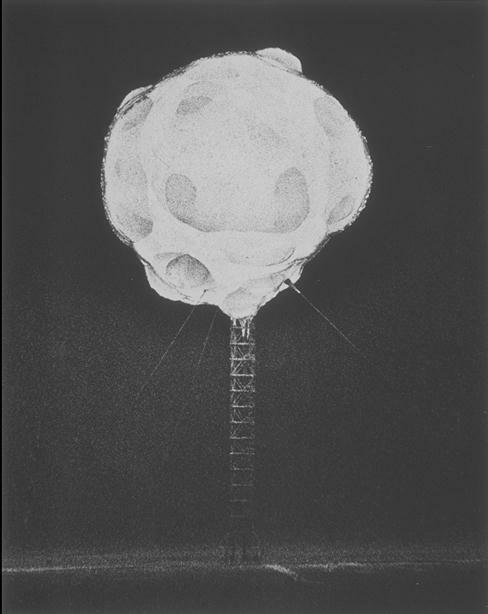 The TX-15 appears to have been something of a transitional design between a radiation implosion fission bomb, and a optimized thermonuclear design. It was originally conceived as a two stage pure fission bomb using enriched uranium fuel, but matured into a thermonuclear system for improved yield as work progressed. It was lighter and had a smaller diameter than any of the other thermonuclear designs then under development. The Nevada Zombie weighed 11,000 lb., had a diameter of 35.4 inches, and a length of 122 inches. The RACER primary produced a yield below the predicted range of 35-40 kt, leading to a design modification for the Simon shot. This was the first device to be tested by UCRL (University of California Radiation Laboratory, later Lawrence-Livermore) the new second weapons laboratory, established by Teller and Lawrence. 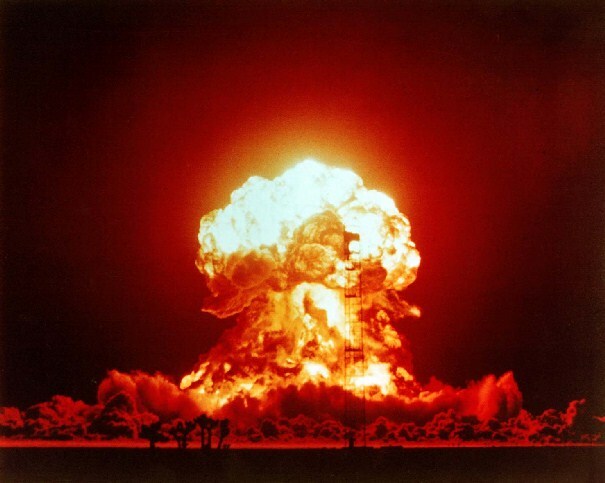 The device, named Hydride I, was a fission bomb based on a enriched uranium hydride fuel. Like its sister device tested in the Ray shot 12 days later, Hydride I was intended for use as a primary in a compact thermonuclear system. 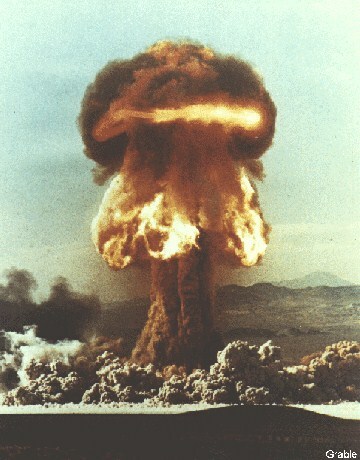 The uranium hydride fission bomb approach was considered during the days of the Manhattan Project as possible way for reducing the required critical mass of uranium. The hydrogen in the hydride compound (UH3) moderates the fast neutrons somewhat, which moves the energy spectrum down into a region where the average fission cross section of uranium is substantially higher giving a smaller effective critical mass. Unfortunately, bomb efficiency is very adversely affected by the slowing down of the neutrons since it gives the bomb core more time to blow apart. The concept (if it worked) would allow low yield bombs that, while inherently inefficient, also did not use up much fissile material. 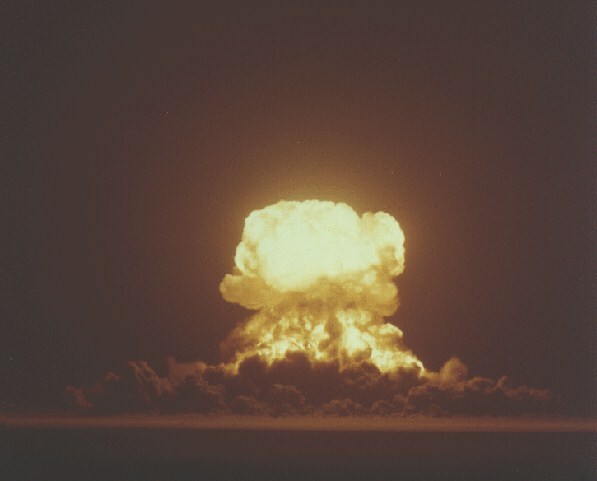 The Manhattan Project had abandoned this idea as a practical bomb design, although uranium hydride systems proved quite valuable for criticality experiments when fissile material was scarce. The famous "Dragon" prompt criticality experiments where a chunk of fissile material was dropped through a subcritical mass to momentarily reach supercriticality used uranium hydride. After the war Los Alamos physicists were skeptical of the usefulness of uranium hydride in weapons. Edward Teller remained interested in the concept though, and used his prominent position to push hydride weapon development when the UCRL weapons lab opened. The Ruth shot was a fizzle. The predicted yield was 1.5 to 3 kt, while the 200 ton yield was a fraction of that. 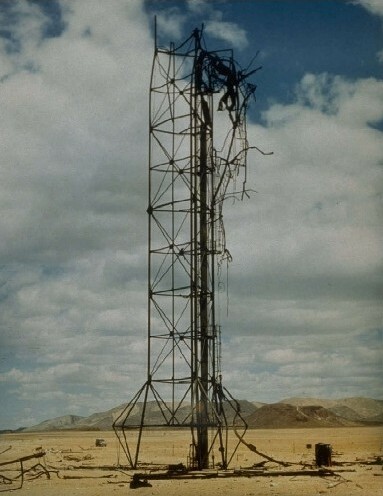 Especially embarrassing to UCRL was that only the top 100 feet of the 300 foot shot tower was vaporized (though much of the remainder was scattered across the desert). It was standard practice at that time for each test to totally erase all evidence associated with it (automatically "declassifying" the site), which Ruth failed to do. Hydride I weighed 7400 lb, was 56 inches in diameter and was 66 inches long. A betatron was used for initiation. B-50 bomber air drop, the detonation was 565 feet east, and 72 feet north of the designated ground zero. 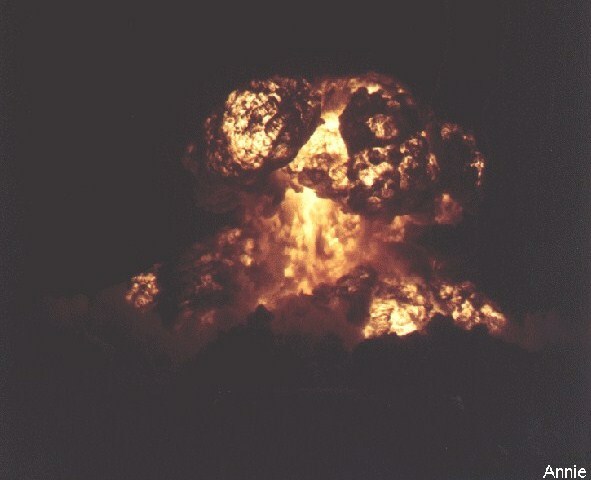 Dixie was a Mk-5D bomb proof test. The predicted yield was 8-12 kt. This test experimented with lithium deuteride as a means of fusion boosting. The device weight was 3260 lb, diameter was 60 inches, length was 128 inches. This was the second test of a uranium hydride device, this time using the heavy isotope of hydrogen - deuterium. The uranium deuteride device was called Hydride II, and was otherwise basically identical to Hydride I. The predicted yield was 0.5-1 kt, the lower expected yield making a smaller gap with the same 200 ton yield as the first test. UCRL scientist Herbert York claims not to regard this test as a failure since it was lower than the predicted range by "only a factor of three". Legend has it that this shot was fired on a tower of only 100 feet (compared to 300 feet for Ruth) to ensure that the tower would be entirely destroyed. This was a test geared toward developing the TX-17/24 thermonuclear weapon design. The TX-17 and TX-24 were the physically largest and heaviest weapons, as well as one of the highest yield weapons, ever deployed by the United States. The test device, code named Simultaneity, was much smaller and lighter however. It had a diameter of 35.4 inches and a length of 224 inches, with a total weight of 11,000 lb (5000 kg). It used a redesigned RACER primary with 2 kg of enriched uranium added to the design tested in Nancy. This addition boosted its yield by almost a factor of two. The predicted yield was 35-40 kt. B-50 bomber air drop from a height of 19,000 feet, the detonation was 15 feet west and 937 feet south of the designated ground zero. 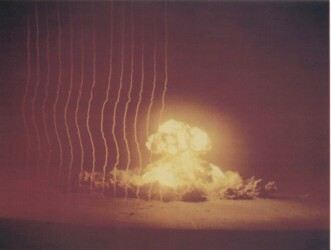 This was a weapon effects test ("E" as in "Encore" and "effects"), and used a Mk-6D bomb with a predicted yield of 30-35 kt. The total device weight was 8330 lb. 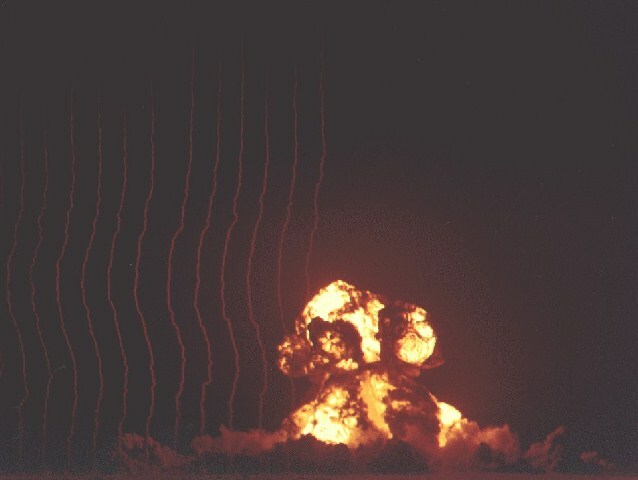 This device, known as HAMLET, was designed by Ted Taylor at Los Alamos and holds the distinction of being the most efficient pure fission design with a yield below 100 kt ever exploded (the most efficient fission weapon of any size was the 500 kt Ivy King also designed by Taylor). This implies an unusually effective compression of the fissile material. The design is noted as being a test of a new hollow core design. It may be that this was the first device to use a hollow core, earlier levitated core devices being solid cores suspended inside a hollow tamper. It is also possible that a two stage levitation scheme may have been used to further intensify the shock compression. Predicted yield was 37 kt. HAMLET used the TX-13D heavy weight strategic bomb design. The system was 56 inches in diameter and 66 inches long and weighed 7000 lb (without the outer bomb case), full weight was 8000 lb. A betatron was used for initiation. This design was never deployed because the design optimization chosen - using a large heavy bomb to get an efficient yield out of a small amount of fissile material - was obsolete in an era of rapidly expanding fissile material supply and with thermonuclear weapons nearing deployment status. The Harry shot is notable for another reason. 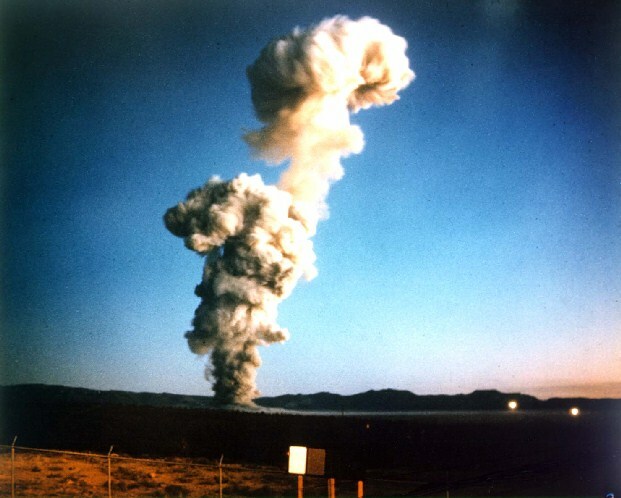 It resulted in the heaviest contamination of "downwinders" - civilians living downwind of the Nevada test Site - of any U.S. continental test, as measured by external gamma ray exposure. For the period up to the end of 1958 (through Operation Hardtack II) it is estimated that a cumulative total of 85,000 person-roentgens of external gamma ray exposure occurred. Of this, Harry contributed 30,000 by itself. This is the first test of a nuclear artillery shell (Grable for "gun") - the 280 mm AFAP (artillery fired atomic projectile). The shot was an artillery delivered airburst. The shell travelled 11,000 yards before detonation which occurred 86 feet west, 137 feet south, and 24 feet above the designated burst point. The 280 mm shell was also a "gun" weapon in another sense, it used a "gun-type" fission weapon assembly method like the Little Boy bomb. 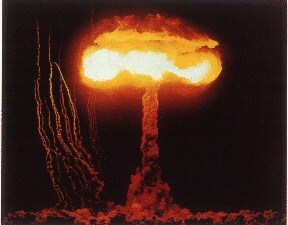 This was in fact the first test of a gun-type bomb (and second detonation - Hiroshima not being a test). The predicted yield was 14 kt. The Mk-9 280 mm (11.02 inch) shell was 54.4 inches long, weighed 803 lb, and used oralloy as the fissile material. Air burst detonation was arranged by a time fuze. The Mk-9 was fired by an enormous 85 ton artillery piece. The gun had a muzzle velocity of 2060 ft/sec, and a range of up to 20 miles. Pick 480x612 (69 K) size, or 376x480 (40 K) size. B-36 bomber air drop, the detonation was 172 feet west, and 232 feet north of the designated ground zero. This was a proof test of the Mk-7 high yield, light weight fission bomb. The diameter of the bomb was 30 inches, making it suitable for external carriage by high speed fighter-bombers. The predicted yield of this device was 50-70 kt, and the actual yield (61 kt) was the highest of any U.S. continenetal test up to this time. 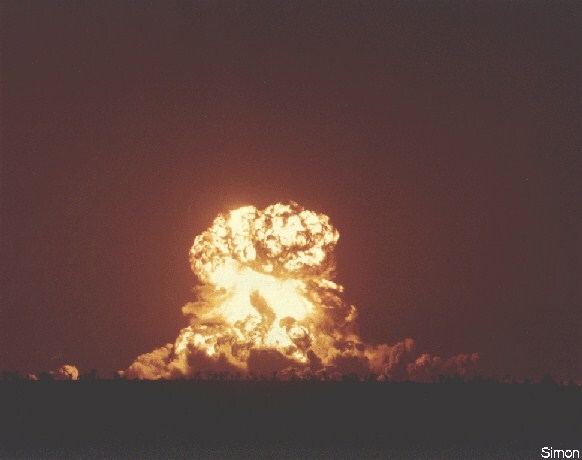 The Mk-7 was the lightest and most compact implosion bomb design yet developed, and its implosion system - a composite COBRA core in a Type D pit - was later used as a primary in several high yield thermonuclear devices in the Castle test series. The complete bomb was 30.5 inches wide and 183 inches long, and weighed 1840 lb. The implosion system weighed 900 lb and used the more powerful Cyclotol 75/25 in preference to the Composition B used in most bombs at that time. Pick 651x519 (109 K) size, or 288x225 (21 K) size. This is one of the Upshot-Knothole tower shots, but the exact test is unknown to me. There were seven tower shots, but it is probably not either of the Ruth or Ray fizzles. The ghostly mottling is due to irregularities in the fireball surface created when the expanding bomb debris, travelling at high velocity, catches up to the decelerating surface of the expanding fireball and "splashes" into it. Photographer: Harold Eugene "Doc" Edgerton, 1903-1990.